(CNN) - White House chief of staff John Kelly personally denied calling President Donald Trump an "idiot" in an afternoon conversation with the commander in chief, relaying nearly the same statement in his face-to-face talk with the President as the one he released publicly, according to an administration official. An NBC report published Monday claimed, among other things, that Kelly had said during an immigration-related meeting that he needed to "save (Trump) from himself" while insulting the President's intelligence by calling him an "idiot." "I spend more time with the President than anyone else and we have an incredibly candid and strong relationship. He always knows where I stand and he and I both know this story is total BS," Kelly said in a statement. "I am committed to the President, his agenda, and our country. This is another pathetic attempt to smear people close to President Trump and distract from the administration's many successes." Trump tweeted his own denial as well, calling the stories "false." The situation is similar to when reports surfaced that then-Secretary of State Rex Tillerson called Trump a "moron." But the White House official pointed out a big difference between the Kelly incident and Tillerson -- Kelly immediately denied the report and denounced it to the President's face. Tillerson declined to do so, simply saying he wouldn't play that Washington game. Tensions between Kelly and Trump have been brewing for weeks if not months. Another White House official said the tensions don't seem any more urgent or dramatic now, but acknowledged that this could accelerate Kelly's departure. "The President hates reading these stories," an official said. "He hates it." Officials have long believed it's just a matter of when, rather than if, Kelly would be fired or pushed aside. The report on Monday capped off weeks of what sources have described as a growing disconnect between Kelly and Trump. One source familiar with the situation said Trump was rankled by the way Kelly handled the Porter situation; the chief of staff initially attempted to defend Porter against the allegation until a photograph of Porter's ex-wife's blackened eye surfaced and sparked outrage. Kelly told senior national security officials in what appeared to be a "moment of frustration" in the last month that he believed the President was becoming "unhinged," according to the senior administration official. 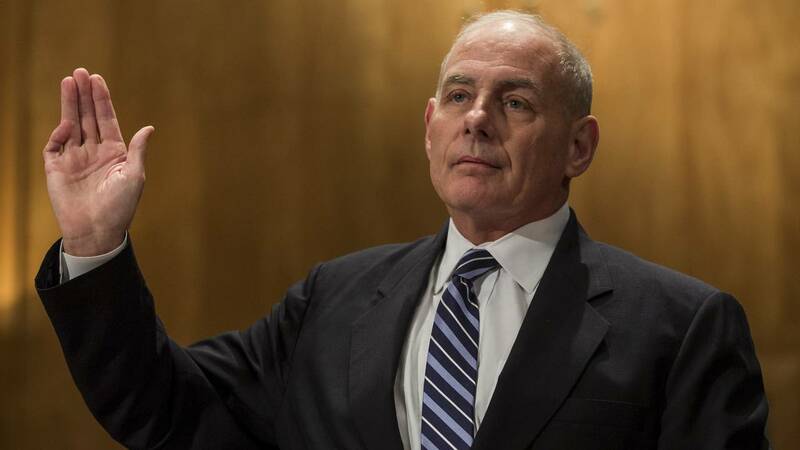 Kelly referred to Trump as "unhinged" during a meeting with the Defense Secretary Jim Mattis, Chairman of the Joint Chiefs of Staff Joseph Dunford and senior National Security Council officials, the senior administration official added. Kelly's comment came as the officials deliberated on the future of the US effort in Syria, following Trump's off-the-cuff comments saying he was determined to get US troops out of the country. Another senior administration official said while Trump and his chief of staff have had disagreements, Kelly has never used that kind of language to criticize Trump. "I don't think anybody is surprised that he and the President have had disagreements in the past," the official said.